This cake smells like my childhood. My mom used to bake apple cakes that smelled just like this (boxed mix, made by UK company Bird's if my memory is correct...which happened to be the first cake I ever baked too) and my family would have afternoon tea. Thank you Dorie for a trip down memory lane! Rather than cake with apples, this is more like apples with a bit of cake. It is so incredibly moist, almost custardy! Actually, it is almost like a very tall clafouti. The batter took no time to put together. I worked quickly to ensure all the apple chunks did not go brown. I used 2 cortlands, 1 northern spy, and 1 ambrosia apples. The only tweak I made to the recipe was rubbing the zest of one lemon to the sugar because I happened to have that around. 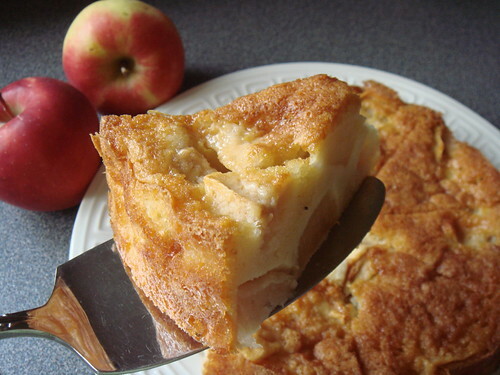 I can see myself making this simple everyday cake very often when apples are in abbundance. The recipe calls for baking the cake in a springform pan, not exactly my favourite baking pan because it's not leak-proof and the slight recessed bottom makes unmolding the cake to a serving plate rather awkward. Well, I solved this issue once and for all. Instead of trimming a piece of parchment paper to fit nicely inside the pan, I just lay a large square over the bottom round. Then I fasten the ring over the whole thing. The ring holds the parchment paper securely while the overhang makes easy work of lifting the cake from pan to cooling rack to plate when I unmold the cake. What took me so long?! Recipe is available at epicurious. Don't forget to check out other members' rendition of this cake! Last week I got three small green tomatoes from my CSA. The first word that came to mind was of course "fried". I tried fried green tomatoes (and green tomatoes actually) for the first time last winter when B and I road tripped from Virginia to South Carolina. This quinessential southern dish was alright but it didn't leave a particularly strong impression. Or perhaps I was just too busy eating biscuits and fried chicken. Either way, I had no intention of turning those three green orbs into fried green tomatoes. What to do? While checking out new cookbooks to add to my collection, I came across Lara Ferroni's website for her book Doughnuts. Her cookbook did not interest me much but her recipe for green tomato chutney certainly did. I had my first taste of chutney a few years ago on a flight from London Heathrow. They served us sandwiches of crumbled Wensleydale cheese and carrot chutney. Sure I've seen chutneys before at grocery stores, gourmet boutiques, and farmers' markets. But I always looked at them with suspicion. 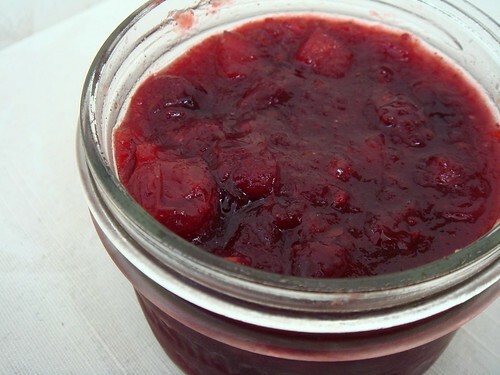 I grew up associating preserves with fruity jams and jellies. Savory and spicy? I was absolutely intrigued with just one bite into that sandwich. I spent the rest of my trip looking for carrot chutney to no avail. That introduction to chutneys made me long for exploring a whole chapter of culinary delight I know little of. I used Ferroni's recipe as inspiration for my version of green tomato chutney. I scaled down significantly since I only had little over half a pound of green tomatoes. 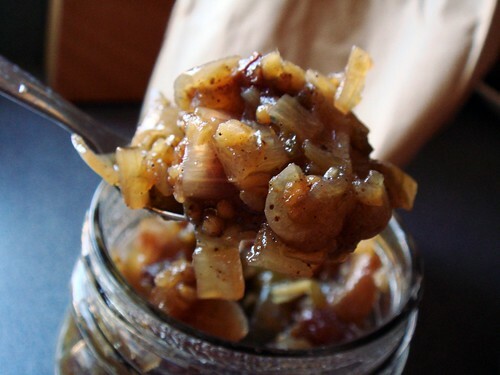 I absolutely love the complex mix of sweet, savory, tart, and spicy in this chutney. Aside from some chopping, it is easy to prepare. Since my batch only yields a 500mL container, I don't bother with proper canning. Simply store the chutney in the fridge and spread it on crackers for a quick snack. Better yet, let me grab some multigrain bread and Wensleydale cheese. I think it's time for a sandwich! In a small saucepan, put in all ingredients except for jalapeno and raisins. Cook over medium heat so it's a bit more than a simmer but not quite boiling. Stir every now and then to ensure even cooking and it doesn't stick to the pan. Cook for 30 minutes. The tomatoes and apples will soften but not completely broken down. Add jalapeno and raisins. Keep cooking for another 30 minutes. In the mean time, sterilize your glass jar by heating it in boiling water for about 10 minutes. When the chutney finishes cooking, the cooking liquid would probably reduced by half and a little syrupy. Taste and adjust seasoning. Add a bit more brown sugar, salt, or spices to your taste. Fill the prepared glass jar and screw on the lid. Cool to room temperature before storing in the fridge. Let the flavour meld for a couple of days before serving. I rarely create recipes entirely on my own but this is one fine example. Last week I bought some fresh goat ricotta from Montforte at the AppleTree Market but it was not quite what I expected. The texture was a little too dry and crumbly compare to the silky smooth fresh cow's milk ricotta that I typically get. Instead of eating them by the spoonfuls, I decided to make them into a savory cheesecake. Last summer I made a savory ricotta cheesecake using zucchinis, using a recipe from 101 Cookbooks. That was the inspiration for this autumn version. Similar to the one I made back in summer, this one contains ricotta (goat ricotta! ), grated parmesan, and topped with soft chevre that browned so deliciously in the oven. As you can see in the side profile of the cheesecake, it's a mosaic of roasted butternut squash, Cortland apples, and sauteed leeks with a touch of sage thrown in. This combination of ingredients definitely screams autumn to me. I hope you enjoy this savory cheesecake as much as I do. Side with a simple greens salad, it's a great meal to be eaten in the cozy indoor or in a picnic to catch the last glimpse of warmth before winter settles in. Roast butternut squash: Preheat oven to 400F. Toss butternut squash with 1tbsp olive oil and season with salt and pepper. Roast on a baking sheet until tender and golden, about 20-30 minutes. While the squash is roasting, heat a frying pan at high heat with 1tbsp olive oil. Saute leeks and sage until fragrant and takes on a bit of colour. Toss in the apples and keep stirring around until apples are a little golden too. Remove from heat and set aside. Prepare a 7" round cake pan with 3" sides or a 7" springform pan by lining the bottom with parchment paper and greasing the sides. When the squash finished roasting, turn the oven down to 325F. In a large mixing bowl and a sturdy spatula, beat together ricotta cheese, parmesan, and eggs. If the mixture looks a bit too dry, drizzle in the heavy cream until batter is a bit thicker than the typical pancake batter. The consistency of your batter depends on how wet the ricotta cheese is. The goat ricotta that I used is a bit on the dry crumbly side so I used all 50g of heavy cream. If your ricotta is very smooth and loose, you can probably skip the cream. Season the batter with about 1/2 tsp fine sea salt and lots of black pepper. Fold in the cooked vegetable gently. Pour the custard into the prepared pan and level the top. If you use a springform pan, set the pan on a baking sheet to catch any leakage. Bake for 60 minutes. Crumble the chevre evenly over the top of the cheesecake. Bake for another 20 minutes until the centre of the cake barely jiggles. At this point, if the chevre is not nicely browned, you can put the cake until the broiler for 2-4 minutes. Watch very closely so your cheesecake does not burn! Cool the cheesecake until the pan is cool enough to handle with bare hands. 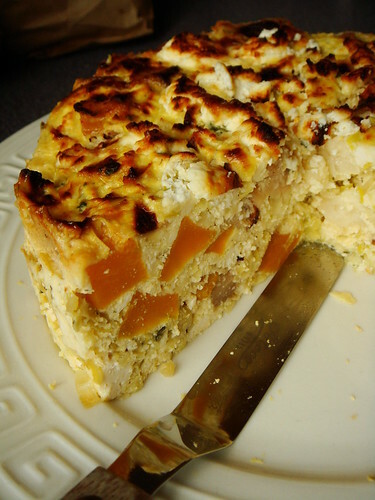 To unmold the cake, carefully loosen the sides with a thin knife. If you use a round cake pan, invert to a plate covered with wax paper and peel off the parchment on the bottom of the cake. Flip the cake right side up to a serving plate and serve while it's still slightly warm. So here's the thing. I love soup, especially velvety smooth pureed vegetable soup. When I discovered the wonder of immersion blender five years ago, I was in bliss. Curried cauliflower soup, apple butternut squash soup, the classic vichyssoise, all could be had with just a quick whirl by my trusty immersion blender. And then one day, I broke it. Being so much in love with a kitchen appliance, I got a fancier replacement but it too got broken within two years. Since then, I've been skeptical of my ability to keep an immersion blender alive in my kitchen. I do not want to risk another loss so I keep my distance. Every time I see a soup recipe calling for "or you can make quick work out of it by using an immersion blender! ", I sigh and move on. Of course it doesn't mean I cannot make puree soup without my beloved appliance. After all, cooks used to (and still do!) 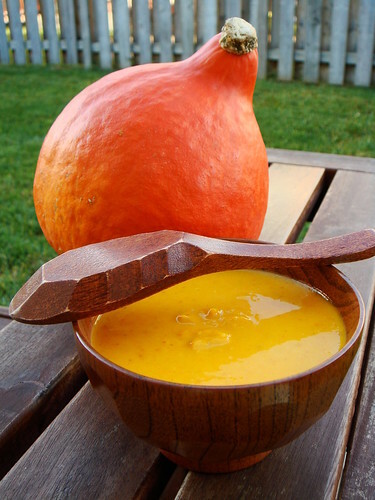 puree with a foodmill or chinois. It's just that transferring hot liquid in batches into my non-leakproof food processor is not my idea of fun. 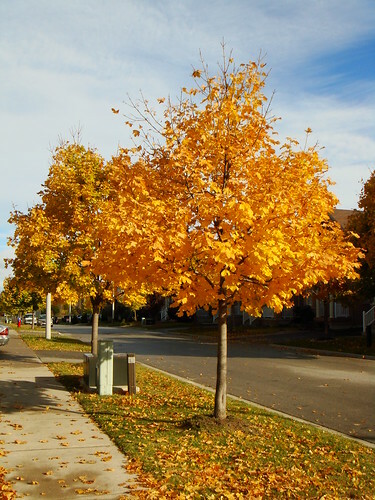 But then, when I look out the window to see my little maple tree all deck out with a golden crown, I cannot get soup out of my mind. Besides, my latest obsession is to hoard winter squash. Perhaps I never paid attention before but this year I've been tremendously lucky to find all kinds of winter squashes I only previously read about. Red kuri (potimarron) with their hint of chestnut flavour, delicata that tastes like sweet potatoes, honey bear that looks like the more common acorn but with a honey sweetness, and of course my beloved kabocha from the Japanese farmstand at J-Town...they all begged me to take them home as soon as I laid eyes on them. Since I received my copy of Dorie Greenspan's Around My French Table, I had my eyes on Béatrix's Red Kuri Soup. What an elegantly simple recipe using only kuri squash, leeks, milk, water, salt, pepper, and nutmeg. Would it be bland without using stock? I trust Dorie's taste and the headnote does promise a phenomenal soup highlighting the chestnut flavour. I adapted her recipe to get around my appliance limitation. Instead of simmering the squash and leeks in liquid before pureeing, I roasted the squash first to make a thick vegetable puree to be thinned with liquid later. This adaptation also makes it feasible to split the work into two days if timing gets tight. I hope you enjoy this soup as much as I do! Dorie is right, you do not need stock. The sweetness of squash and leeks is more than enough to make this soup truly delicious. Preheat oven to 400F. Lop off the pointy top of squash and cut in half. Scoop out all the seeds and strings. There is no need to peel. Place squash halves cut side up in a small roasting pan and roast in oven for about 45 minutes until tender. Set aside. Heat a large pot (I used my 5qt cast iron dutch oven) over medium high heat and drop in the butter. Sautee the leeks until fragrant and slightly browned. Remove from heat and set aside. Roughly cut the cooked squash into chunks and puree in a food processor with the leeks. If it is too thick, drizzle in a few splashes of milk to move things along. You may need to puree in batches if your food processor is not large enough. Keep going until you have a smooth puree. I have about 6 cups. At this point, you can store the vegetable puree in the fridge if you run out of time to finish cooking like I did. Put the vegetable puree back in the large pot along with milk and water. Bring it to a boil over medium high heat and stir often. I love my soup thick and creamy but you can thin it with more water to your liking. Season with salt, pepper, and freshly grated nutmeg. Serve immediately while it's piping hot. It's Friday before Thanksgiving long weekend and I'm all poised to throw myself into a frenzy of Thanksgiving cooking. This year I'll be hosting an intimate dinner for three. If all things go as planned, we'll be enjoying corn chowder, roast capon, mushroom chestnut pancetta dressing, pan gravy, spiced port apple cranberry sauce, maple glazed sweet potatoes, and, and, and...some sort of potato sidedish. This is embarrassing to admit but I've been too lazy to label the varieties of potatoes I received from my CSA. Believe me, it's been different every week! Up until half an hour ago, I was certain that I'll combine all those purple beauties into a dramatic purplish garlicky mash. But now I am not sure whether I have Russian Blue (high starch, low moisture) or Purple Viking (low starch, high moisture) or a bag of each. On the bright side, they are stored neatly in seperate paper bags. So my game plan is to reach for one of the two bags, cut a potato open. If it is a Russian Blue, I'll make mashed potatoes. If it is a Purple Viking, I'll make a warm pesto potato salad. I love surprises. What will NOT be a surprise is our dessert. Since my reintroduction into the world of pie baking, I am proud to say that I am one confident piemaker. This year, there'll be three pies to share among the three of us. First up, caramel pumpkin pie (Dorie Greenspan's Baking From My Home To Yours) made from cute little pie pumpkins from my CSA. This is the first time I work with fresh pumpkins instead of canned pumpkin puree so I've been a bit cautious. The pumpkin puree looked a bit watery to me so last night, I whipped out my brand new jelly bags (purchased at Zabar's) and strained out the excess moisture. Who knew my newly-acquired canning skills would be put to good use? Pie #2 is of course the classic double crusted apple pie. I've been lucky to find gorgeous Northern Spy apples at my local farmers' market this week. That is my absolute favourite baking apple so I snapped up 14 for $6. A flakey cream cheese crust with juciy spicy filling, what's not to love? Last but not least, pie #3 will be my very own creation of [drum roll please] Black Forest Cream Pie. I can already taste it in my head...flakey cream cheese crust lined with dark chocolate, chocolate pastry cream, red wine poached cherries, kirsch whipped cream, and shaved chocolate. Oh my! This will totally be the piece de resistance for Thanksgiving 2010. All these cooking and cleaning obviously require plenty of energy. Of course I thought of that too. I need quick easy meals to sustain me, food that I can eat right out of the fridge before turning my attention back to cooking. I made a hearty vegetarian main course salad last night and I can't wait to eat it again today and tomorrow. 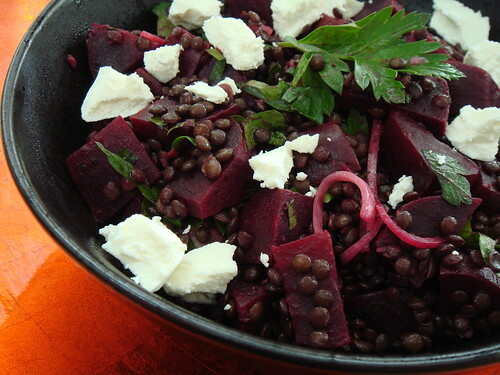 A salad of sweet beets, lentils, and goat cheese tossed in shallot vinaigrette provides great balance of carbs, protein, and fats. Besides, it's delicious and totally seasonally appropriate. The key to flavourful lentils is to season it while it's still hot. It's imperative to have your vinaigrette ready when the lentils are done. To cook the beets: In a medium saucepan, bring water to boil and drop in the beets. Cook for 30-45 minutes until fork-tender. Remove from heat until beets are cooled enough to handle. Slip the peel from the beets and chop into small chunks. Can be made a day in advance. To cook the lentils: In a medium saucepan, bring water to boil. Add in bay leaf, thyme, and lentils. Turn heat down and simmer for approximately 15 minutes until soft. While the lentils are cooking, make the vinaigrette. In a large mixing bowl, stir together shallot and red wine vinegar. Let it marinate for a few minutes to soften up the shallots. Whisk in olive oil and Dijon mustard until homogenous. Drain lentils and discard herbs. Immediately toss with vinaigrette in the mixing bowl and season with salt and pepper. Fold in parsley and beets. Adjust seasoning if necessary. Top with goat cheese and serve. I like this salad warm, room temperature, or chilled. Convenience is never overrated! Thanksgiving is once again upon us. As usual, I kick off my feast preparation with a batch of cranberry sauce. Okay...not quite. I already got a head start by turning my pie pumpkins into pumpkin puree. This year I'm combining two previous favourites (this and this) into one awesome creation. Behold the Spiced Port Apple Cranberry Sauce! Be sure to use cooking apples that are a bit on the tart side and hold their shape when cooked. Northern Spy is my favourite but other varieties such as golden delicious, granny smith, honeycrisp would work too. You want apple dices in the sauce, not applesauce! You can make this up to four days in advance. It improves after a couple of days as the flavours have time to meld. Grate ginger root into saucepan. Over a measuring cup, juice the orange. Add the port wine and top with enough water to have a total of 250mL or 1 cup of liquid. Add all liquid into saucepan along with cinnamon, cardamom, and sugar. Bring to boil. Add diced apples and simmer at medium heat until the apples are almost tender. Add cranberries and simmer for approx. 10 minutes until most of the berries pop and sauce thickens. Store in covered container and chill until ready to use.